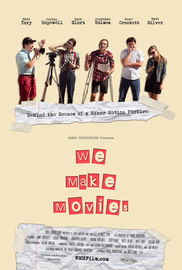 A heartfelt and hilarious comedy chronicling the ups and downs of a group of college students who spend their summer making a movie for their town's Film Festival. A hilarious and heartfelt look "behind the scenes" as a group of college kids spend their summer making a movie for their town's Film Festival. Cameras chronicle the tumultuous ups and downs (mostly downs) as an egotistical student Director rounds up his friends (and some bystanders) to help make his masterpiece: a movie that blends together all the greatest films ever made. Writer / Director / "Stevphen"
The movie PLUS an Extended Blooper Reel, Deleted Interviews, a Behind-the-Scenes Featurette, and our short film "Out of the Blue"!